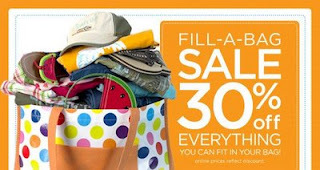 Gymboree is having a 30% off “stuff a bag” sale in-store! The sale is going on online too! If you are a Gymboree cardholder, you’ll get an additional 5% off at checkout. And one more thing, you’ll earn $25 in Gymbucks for every $50 you spend. Now that’s a great Gymboree Deal! !